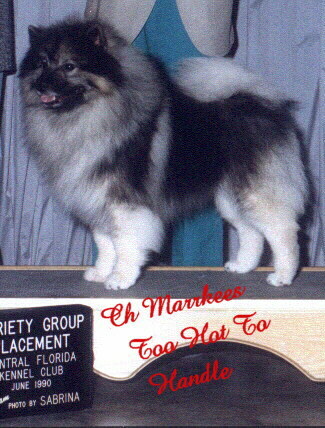 CH Marrkees Too Hot To Handle Reggie is a multible group placer and a very beloved pet. He is my wonder dog. His apt. home caught on fire and Reggie tore up his crate and went into the shower where a fireman found him he growled at the man until he removed his mask and Reggie could see he was human. His lungs were severly injured, had corneal burns and his coat was also burned. How ever he was able to finish his CH 1 month later! And now at 13yrs old-he is still healthy and happy. His lungs are fine, his vison is fine, and his coat has always been lovely! Reggie's Mom Tammy has always been a very devoted and loving mom!